Rural women play a vital role in increasing in food production. Women farmers should have better access to varieties and resources to help mitigate the effects of climate change on their rice production. More importantly, instead of treating them as mere beneficiaries, they should be viewed as experts who possess the know-how that can complement experts’ formal knowledge. Paddy cultivation is the main alternative livelihood for women in eastern India. This is part of changing landscape of agriculture across Asia. The traditional role of women in rice farming is rapidly changing, according to Dr. Samarendu Mohanty, head of the Social Sciences Division at the International Rice Research Institute. They are going from farm laborers to farm managers and owners because of the outmigration of male farmers to urban areas in search of better economic opportunities. Despite the changes, the extension system in most developing countries has not made significant impact on small-scale farmers. Seed replacement rates remain very low, and access to new seeds continues to be problematic. Most farmers grow old varieties and use their own seeds. In order to address these challenges, new approaches based on community participation have come to the fore as a means of scaling up agricultural technologies to a wider audience. 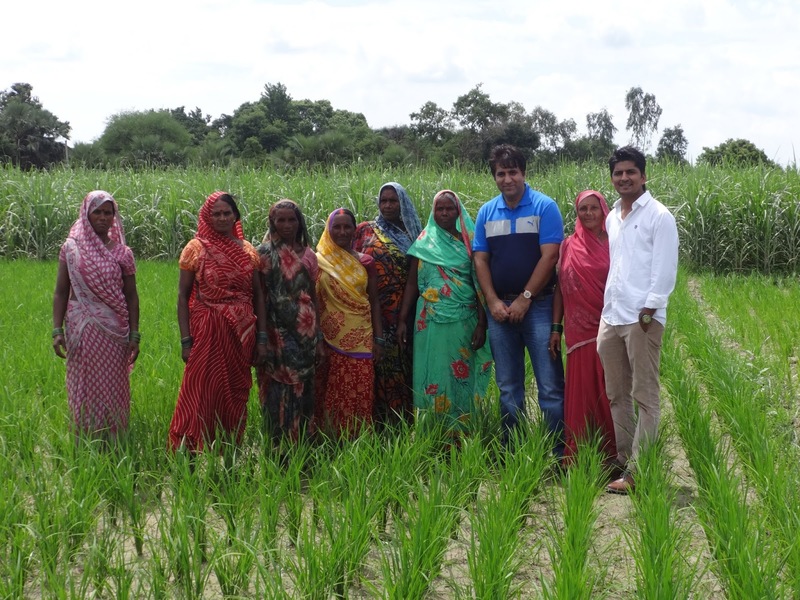 The Stress-Tolerant Rice for Africa and South Asia (STRASA) project is initiating approaches that promote women farmers as principal agents of change in their communities. The new strategy focuses on enhancing their learning processes, capacity building, and empowerment to improve their ability to adapt and make better decisions. The project is also training women farmers—being the actual operatives of the most rice farming practices—to provide accurate feedback to researchers. STRASA is using this approach to disseminate information and seeds of stress tolerant rice varieties in eastern India. It aims to reach all farmers in an entire village by working with members from existing women’s groups in the villages because most social networks, where interaction is greater, are found within these groups. The approach works on the premise that female farmers would facilitate the further spread of knowledge and seed of stress-tolerant rice varieties (STRVs) through their social networks thereby generating sustainable processes and practices. If a member of a self-help group successfully adopts a technology, other members may not only learn the innovation from her but also share it with others creating a multiplier effect. Moreover, in most of the stress prone areas with inadequate extension services available, women are taking the lead in all the operations of rice farming. They can be the best agents for extending the knowledge and seeds of STRVs. Because stress-tolerant varieties are knowledge-intensive technologies, representative farmers go through a joint learning process with researchers and extensionists. It is necessary for them to understand the subject behind the practices before implementation. STRASA facilitates their interaction with researchers and provide hands-on trainings on quality seed production, seed testing, and safer storage. With the launch of phase 3 of STRASA, new lines developed by the International Rice Research Institute have been released in India for flood and drought stresses. These are Bina dhan11, Samba Mahsuri Sub1, DRR42 (IR64 Drought), DRR43, DRR39 and DRR44. Some of these varieties are already popular in many of the regions of eastern India, where they are being evaluated and promoted through private seed companies and other channels. The importance of women in the promotion and dissemination of STRVs in the first season of their release can be clearly seen as these varieties have been disseminated through women's networks with the help of NGOs working with women’s self-help groups and women farmers.STRASA works with groups who have already an established base in these areas working for improving the livelihoods and empowering women through different interventions. One organization, Rajiv Gandhi Mahila Vikas Pariyojana (RGMVP) organizes self-help groups for poor rural women each with ten to twenty members. RGMVP has developed a cost-effective, sustainable, and scalable poverty reduction and women’s empowerment model adopted by STRASA for the dissemination of knowledge and seeds of STRVs like IR64 Drought (DRR42), Samba Mahsuri Sub1 and Binadhan 11. Farmers are initially educated about the basics of rice farming and made aware about the characteristics of the new varieties. Trainings are conducted for different operations from seeding to storage, to ensure that quality seed is produced which can be bought back from the farmers and sold/shared to others as a part of the RGMVP model. Other NGOs which are engaged in the promotion of new STRVs through women’s networks are Vishwalok Jan Sewa Sansthan in eastern Uttar Pradesh, Baster Sevak Mandal in Chhatisgarh, and Samekit Jan Vikas Kendra in Jharkhand in eastern India. A total of about 1,350 female farmers from different community groups across the four states were reached through this initiative.